I wish I knew the actual photo source, I reckon it some sort of edgey fashion magazine like Dazed and Confused... If any of you know, please drop me a comment so I can amend this. P.S. 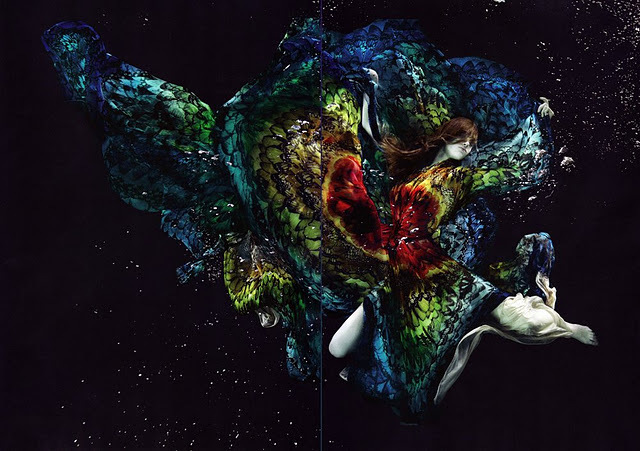 I came across this incredible video entitled "Dynamic Bloom" by Nick Knight. If you like the above shoot, I highly recommend giving this video a couple minutes of your time. There couldn't have been a more appropriate title for this video, it feels like it should be some sort of commercial because it is so stunning. 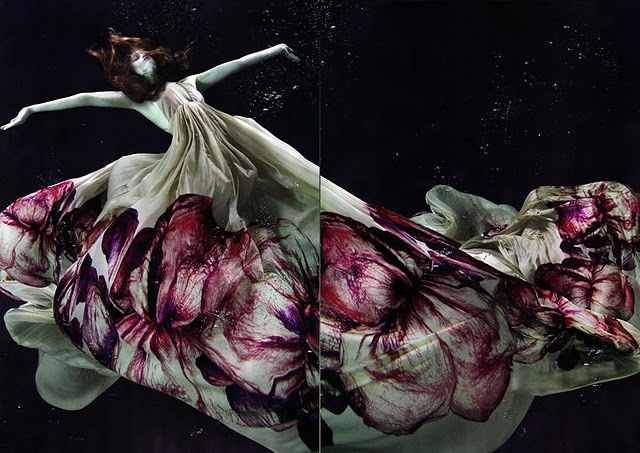 Really gorgeous photos...I too love underwater fashion photography! The poses are so organic in these shots, really enhances the clothing. Thanks for the comment on Gabby's blog! Just became your newest follower and look forward to your blog. LOVE it already! They look fabulous!!! Great Post and inspiration! Wow! They're the image for the word BEAUTIFUL! SO beautiful! Love how they all look so mysterious! A Fotografia subaquática dá-nos uma visão de movimentos apenas possíveis nesse meio; torna-se ainda mais fascinante quando a tomada de vista se faz para produzir efeitos tão belos e inesperados, sobre modelos ou moda. 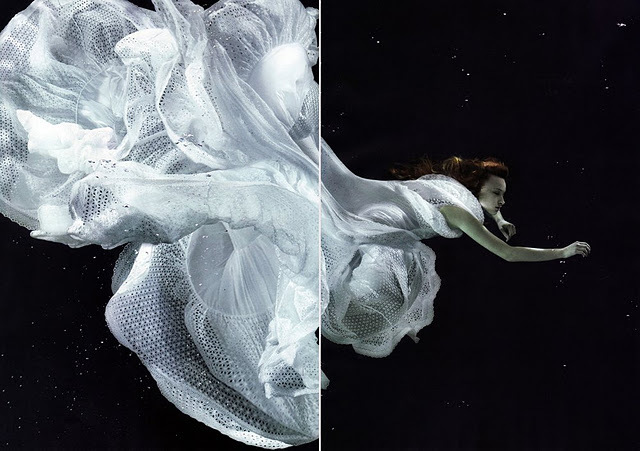 The Underwater photography gives us a vision of this movement only possible means; becomes even more fascinating when the decision is made to order to produce such beautiful and unexpected effects on models or fashion. the photographs are so beautiful! I love the underwater and night sky theme combined in these pictures. Two of the most romantic things about nature captured. Sort of like Dark sparkling angelic mermaid. Love it!!! I agree the video could have had a better title. The use of the word "dynamic" just doesn't go well with it. The third pic is..wow gorgeous ! Wow, stunning! So gorgeously captured...love how vibrant the colors look! So magical, these photos are awesome! Not a fan of ANTM, but this shoot is GORGEOUS. It didn't even look like it was taken by amateurs... (Am I allowed to say that?) But, this is beautiful. I can only imagine how tiring it must be, to float around in a tank; keeping in mind of their face, and their top to toe. wow wow wow. The third photograph took my breath away but they are all gorgeous! Thanks so much for visiting my blog, I hope you stop by again soon! Love the pictures, so ethereal. So beautiful and poetic !!! those pictures made me dream,... fly,... they are gorgeous!! this post was amazing and i got chills the video was just ace. Dresses are so beautiful ! Awesome! THis one's my favorite ANTM episode! I love underwater photos too! You picked some beautiful ones, I pinned a lot of these on pinterest awhile back but it's nice to know about the provenance, it's one of the big issues of the internet - the photographers don't always get credit. Gorgeous video too, just lovely! Wow, these are gorgeous gorgeous pics!! 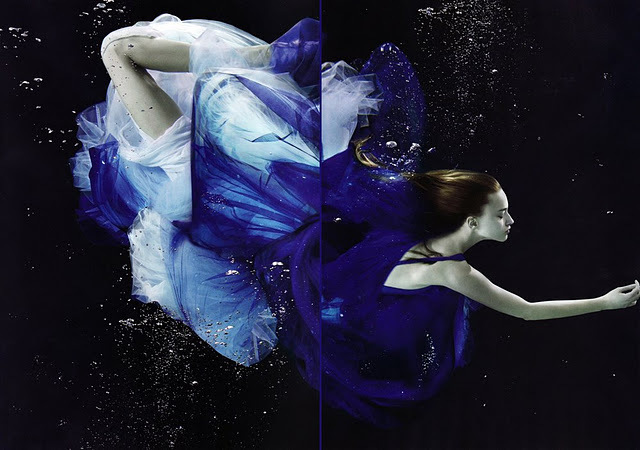 The water just takes these already beautiful dresses to another level, the effect is very cool. Thanks for sharing! OoO I love the underwater pics. So eerie, so beautiful! Damn, these underwater shoots are amazing! This is so beautiful. One of the most amazing shoots I've seen to this date! i agreee! there's something very artistic about it! Wow, that really looks amazing! It's dramatic and fragile at the same time. wow so beautiful pictures, is like the lady of the ocean ! loved! I love underwater photos! amazingly stunning!